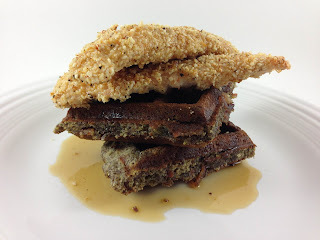 Food, this post is all about the food. The lamb here is from SonRise Ranch, it's so tender and absolutely delicious. I have been super busy recently, lots of news to share...later. 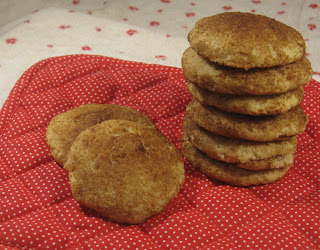 For now, just enjoy this recipe! Note: I used a mandolin to cut the zucchini, but you can also use a peeler for a more delicate "noodle". Mix all meatball ingredients together in large mixing bowl, use your hands. Form into balls. I was able to get 14 meatballs, yield depends on size. Melt a dollop of coconut oil in a large skillet over medium-high heat. Working in batches, if necessary, brown meatballs on all sides. While your meatballs brown, make your sauce. Saute onion and garlic in medium sauce pan for 2-3 minutes before adding tomato sauce and diced tomatoes. Sprinkle in crushed red pepper. 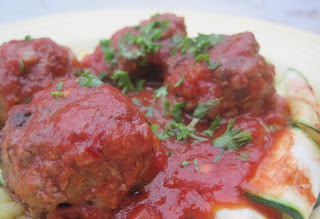 When all meatballs are brown, add to sauce and cook for 5-8 minutes, or until meatballs reach desired doneness. 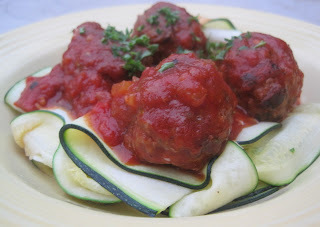 While meatballs cook in sauce, gently saute zucchini ribbons in dry non-stick pan, until slightly softened. Portion zucchini into bowl and top with meatballs and sauce. Enjoy!